Dystopian fiction is one of the fastest-growing genres out there. With the wildly successful series The Hunger Games being made into a movie, and even a movie version of Stephen King’s The Stand in the works, the genre is sure to gain even more popularity and many more readers as well. 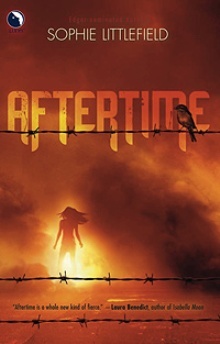 Aftertime, by Sophie Littlefield is dystopian fiction, mixed with a little bit of horror, along with a touch of sci-fi and some romance as well. Cass Dollar wakes up sometime after the end of the world, with no memory of how she got where she is. She remembers being attacked by Beaters, the zombie-like creatures that plague the dying California countryside, but she has no idea how she survived. No one ever has, not once the Beaters carry them away. But Cass survived, and now she has only one goal: to find her daughter, Ruthie. With the aid of Smoke, a stranger intent on helping her, she sets off to find Ruthie. They have to travel miles through Beater territory, and escape the clutches of the Rebuilders as well, power-hungry, controllers who want to build a society, and one where they run things, but for Cass, anything is worth it, as long as she can have Ruthie back. Sophie Littlefield paints an evocative picture of this post-apocalyptic society, the result of bioterrorism attacks and botched genetic engineering. Despite the horrific descriptions of the Beaters and their flesh-eating ways, the story is focused on Cass’s journey, not just to find Ruthie, but to finally find self-acceptance after years of addiction. While Cass is a troubled character, the author brings her to life so well that the reader understands why she’s done the things she has—and feels her horror and grief over her past, as well as her overwhelming love for her daughter.